Karen Pryor introduces Stephanie Tagtow's success story. I hear this question often: "Yes, but does it work with kids?" Do you think of clicker training as something that's good for dogs and other animals, but not right for people? The principles of learning are always the same. The technology of training without punishment, and with a marker, works with any organism with a nervous system. Adapting positive reinforcement training to human problems just requires slightly different methods. For example, you can tell your learner what you will click for. We call these special techniques for humans TAGteaching. We call the marker sound a TAG. We call the criterion being clicked a TAG point. Beyond that, the training is the same: being sensitive to reinforcement choice, breaking behavior down into successful units, creative thinking, and timing. The outcome? Just what you'd expect. The learner is thrilled. Long-standing problems vanish, to be replaced with good new behaviors. Even the beginning teacher has success, so the teacher is thrilled, too. The story below is a great example of TAGteaching—see what you think! Is there anything going on in your life that could use a little tagging? "Roman, please put your things away and get to your seat." "Roman, you need to take your journal out like the other kids." "Please put your hand down until I am done with the instructions." "Why didn't you finish the worksheet?" "Please keep your hands to yourself." "Roman, you need to clear off your desk to go home." Roman, a vibrant six-year-old boy with a shock of curly blond hair, was bombarded with reminders like these at school and at home—with little impact. It seemed as though he could not focus on the task at hand. Every school day started with the same six-step routine, but for Roman it never became a habit. Worksheets were rarely completed. Remaining quiet in class seemed impossible for Roman. Finishing his homework was painful for all involved, if Roman finished at all. "We've tried everything," his mother said during one of the impromptu gatherings parents enjoy after drop-off. "We just don't understand it. Roman is brilliant when it comes to dinosaurs. He can name every one, tell you from which period they originate, and list their characteristics. But he can't or won't finish a math worksheet and he gets failing grades. If something doesn't change soon, he won't make it to second grade next year." I knew Roman. He was very bright, in a free spirit, unfocused way. I had faced similar focus challenges with my own children in the past, and had utilized TAGteach successfully with them to build behaviors. I was confident that applying TAGteach principles to Roman could help him focus, too. I was confident that applying TAGteach principles to Roman could help him focus. Since offering advice to another parent can be very touchy, I was apprehensive about raising the subject with Roman's mom. I carefully drafted an e-mail to her, introducing the general concept of TAGteach, and describing it as an effective tool with which I had success with my own children. "We are desperate. We will try anything at this point," was her response. The next day we met in the school library, discussed the principles, and viewed examples on my Smartphone. "I sort of get it, but I don't completely get it," was Roman's mom's initial response. We planned to meet again that weekend to go over some techniques and apply them to Roman. In the days between our visits, Roman's mom made a list of all the things that Roman likes. The list included foods, toys, and activities, anything on which he would place a high value. Mindful of the sugar-laden environment surrounding our children, I encouraged Roman's mom to think instead of privileges and activities that he particularly enjoyed. When picking an appropriate reinforcer for Roman, it was important to set him up for success. (And, a sugar-based reinforcer would not benefit this unfocused child.) Roman's parents decided to use a token system of reinforcement. For each successful TAG point, Roman would receive a chip that he would save. On the list of items or activities that Roman truly enjoyed, each item had a specific number of chips associated with it. Roman could cash in his chips for items on the list. Enjoy this video of the tagging game. The next weekend I introduced Roman and his family to a tagging game that would teach the child relevant terms and the parents the process. This simple introductory game is designed to give the parents an opportunity to develop TAG points (the child's focus point, what the child will attempt to do), to tag the child's correct responses with a "click" from a toy clicker, and to give appropriate reinforcement. The child learns that a TAG point is what he will attempt to do, and that a "click" means s/he has been successful. The absence of a "click" means that s/he should try again. The child's successful tags are recorded with a "tagulator." One example of a simple TAGulator is a woven string of beads where the beads can be pulled to one end to show the number of successful tags. When the child's TAGulator indicates that s/he has achieved a certain number of tags, the child is reinforced with something of value, such as special play time. Playing the game, the child begins to build value for the TAGulator, as well as build value for the TAG game itself. 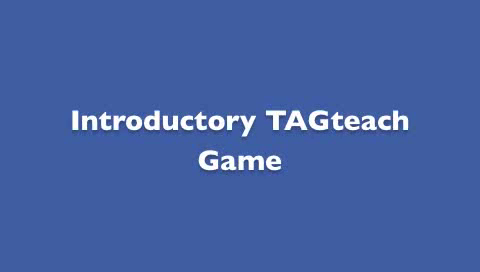 This video is an example of the introductory TAGging game we used with Roman. The game can be tailored to meet a child's current developmental stage. I encouraged Roman's parents to try the TAGging process and principles at home, focusing on smaller behaviors and avoiding the big elephants for now. It was important for Roman's parents to have an opportunity to try out TAGteach in a neutral environment where they could work on building simple behaviors. It was equally important for Roman to develop an interest and value for the TAGging games. Working on simple behaviors, everyone was able to enjoy the process, individual successes, and the end results. Working on simple behaviors, everyone was able to enjoy the process, individual successes, and the end results. At home, Roman's parents applied what they learned from the introductory tagging games to Roman's bedtime routine. Teeth-brushing was a particularly messy situation when Roman was tired and fidgety. Mom decided to try TAGteach with teeth-brushing and gave Roman TAG points to break down the process. "The TAG point is to point your belly button toward the mirror," she told him. The mirror was located over the sink and this TAG point kept Roman standing still at the sink while he brushed his teeth. Mom added other TAG points to keep Roman on task. Later that night, Roman's mother texted me, "I was nervous about coming up with my own TAG points and was uncertain if Roman would engage in the game. But he did! He loved it!!" The benefits of TAGteach were immediate. This was a watershed moment for Roman's mother. She was elated at the success of the exercise and about all of its implications. She gained confidence after feeling powerless for so long. Quickly, both parents became skilled in observing behavior, developing TAG points, marking the child's response appropriately, and following up with reinforcement. We were ready to take it to the next step. We talked about incorporating TAGteach principles to school-day activities. First we needed to identify pertinent undeveloped behaviors, next devise a plan of action, and then put the plan into action. The three main behaviors that needed to be developed were active listening, behavior chains, and task completion. We decided to start with a behavior chain for the drop-off routine in the morning. The three main behaviors that needed to be developed were active listening, behavior chains, and task completion. The process of dropping off Roman at school occurred in an extremely distracting environment. Roman's parents and teacher tried to keep him on task with the morning routine. However, he wandered off task to chat with a friend, look at something interesting, or start playing. The goal was to have Roman walk into the classroom and complete all six tasks independently—with zero reminders from his parents or teacher. Action Plan for "Go Start Your Day"
The TAG point is to take your folder out of the backpack. The TAG point is to put your homework folder in the basket. The TAG point is to put your lunch box in the small cubby. The TAG point is to put your backpack in the large cubby. The TAG point is to hang your jacket in the cubby. The TAG point is to start working on your seat work. Repeat from Day One, continuing to build value for each individual task. After you put your folder in the basket, the TAG point is to take care of your cubby. After you take care of your cubby, the TAG point is to start working on your seat work. The TAG point is to "Go Start Your Day." Here is how it played out in real life—adjustments were made on the fly. Roman's mom walked into the classroom with him and gave him a TAG point for each task. In order to avoid unwanted attention, a verbal tag was used instead of a clicker. Roman was successful with each TAG point and pulled down a bead six individual times. He was off to a great start! After only one day, Roman called out each of the TAG points related to his cubby as he completed them, without assistance from his mother. He was successful with all of his TAG points and pulled down a bead at the completion of each step (for a total of six beads). While the action plan for Day Three called for Roman to start combining six steps into three behaviors, Roman proceeded to do all six steps before his mother gave him a TAG point. He earned one TAG point for the entire process, pulled a bead down, and started his day happily. His mom was concerned that Roman's behavior would deteriorate since his reinforcement went from six beads to only one. But this appeared to be an example of independence becoming more reinforcing than anything that was associated with pulling down a bead. This appeared to be an example of independence becoming more reinforcing than anything that was associated with pulling down a bead. Roman's mom stayed at the doorway and sent him to go start his day. Roman went straight to his cubby, took care of his tasks, dropped his folder off and headed to his seat, and then started on his work. He glanced up at his mom in the doorway and smiled at her. She held up the TAGulator and pulled a bead down for him. He appeared to be pleased with himself. It was Dad's turn to drop Roman off and see if the action plan worked. Roman proceeded into the classroom on his own and was successful at starting his day. Roman's dad stood in the doorway and watched his son complete his morning tasks independently. This time, when Roman sat at his desk to start on his work, he saw Dad standing in the doorway with a "thumbs up," indicating that he had again achieved his TAG point. Why did TAGteach make such a difference for Roman? Starting his day had been a process he struggled with all year, despite having the opportunity to practice every school day. How could his behavior change so quickly? We didn't alter the steps that the teacher had written out for the students, yet the simple TAGteach action plan altered a child's behavior very quickly. TAGteach is beautifully simplistic at its core. Behaviors are broken down to small individual steps that are reinforced and then built on. The focus is on what the child should be doing and not on what s/he is doing wrong. The TAGteach process provides the child clear direction and helps the parent learn to communicate concisely in a manner that is focused, direct, and absent of verbal white noise. It is a process that is easy for both the parent and child to understand. Roman's adventures with TAGteach did not stop with his starting the day routine. Active listening skills and task completion followed on the heels of the behavior chain lesson. His parents are now avid TAGteach fans and have incorporated TAGteach into their daily lives, including interactions with their daughter. Their two children love this "new game." Roman's mom says, "TAGteach has taken a lot of the struggle out of the daily routine in our home. The kids are much more interested in earning their reinforcement than in ignoring us." Roman's mom became a TAGteach advocate, and recommends it others. "I really believe this to be a useful tool that can benefit any child-parent relationship. It is work—but I look at it as an investment. I want to raise children who grow up to be motivated and successful adults. We are definitely on that path."